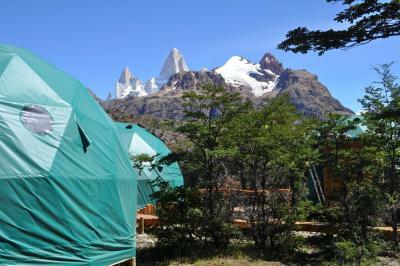 Lock in a great price for Patagonia Eco Domes - rated 8.7 by recent guests. 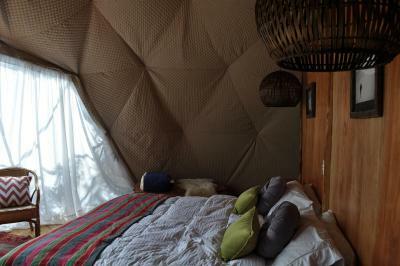 Very Nice and different experience to sleep in a dome! 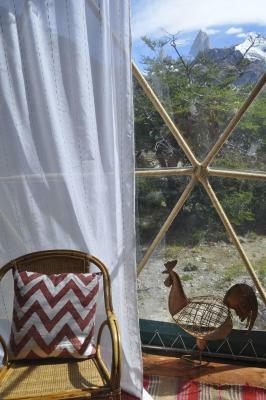 The tent was really nice with a super view of the mountains and the bed was very comfy. It’s a little noisy at night due to the wind, but earplugs can do the trick. 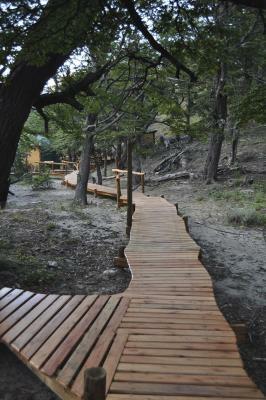 Right next to the eco domes there is a very beautiful trail to see the laguna de los très ! 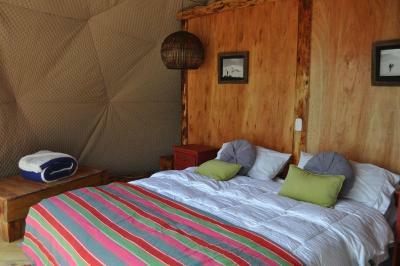 Great view, comfy bed, lovely fire, friendly staff, close to trails, nice and relaxing. 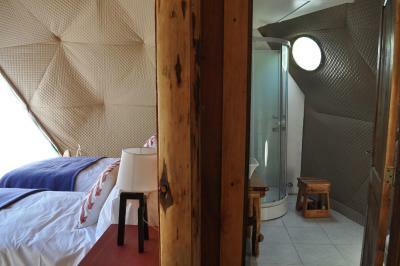 Great for a few nights luxury away from the main town. Good breakfast and packed lunch. There is an office in town where you get the shuttle from at 12h and 17h - they also let us leave our bags there and get changed in the changing room after a very wet walk! 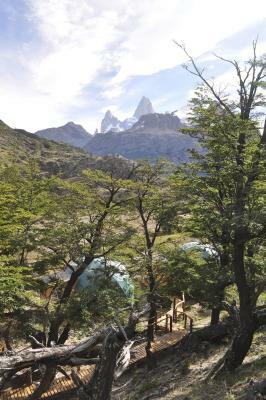 Amazing view of the Fitz Roy mountains from our bed and the dining/common room, delicious breakfast and dinner with tasty box lunches to take on hikes. All staff were incredibly kind and accommodating and made the experience very pleasant. The rooms are spacious and comfortable and closely situated to a trail head that takes you to several great hikes. Would absolutely stay here again! It was nice to have tea and coffee in the middle of the afternoon. It is not a 5 star hotel, but it is a 5 star experience!!! everything was well organised and run. Excellent staff, always attentive a nd smiling. They really make the place warm and friendly. I would recommend to stay for at least 3 nights to enjoy the beauty of the surroundings. 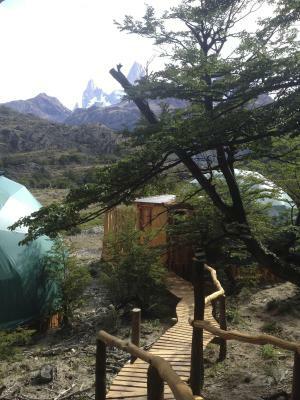 The spectacular view of fitz roy, the very comfy bed, the awesome food and the ridiculously good wine (recommended by their wonderful staff). Also great spot to hike from- so many options and a full hour closer to Laguna Los Tres (which you MUST do). Displaying panoramic views of Fitz Roy hill, Patagonia Eco Domes provides accommodations in El Chalten. 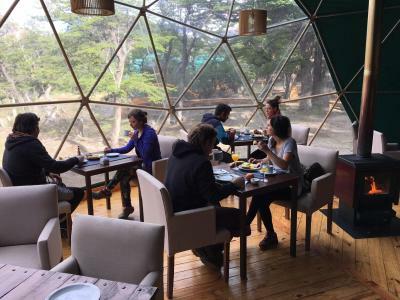 Surrounded by a lovely garden covering over 3 hectares, this tented camp offers private access to Laguna de los Tres trail, as well as a daily breakfast. 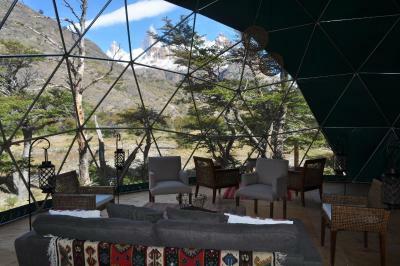 Rooms at Patagonia Eco Domes feature alpine styles and are comprised of fireplaces, seating areas and heating. 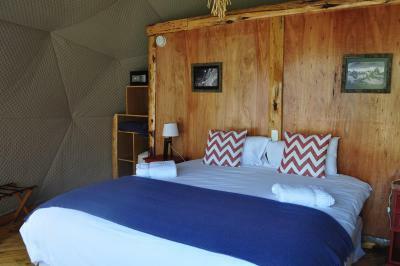 Each full bathroom is en suite and includes free toiletries and a shower. Bed linens and towels are provided. 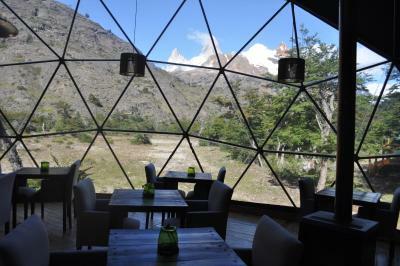 At Patagonia Eco Domes guests can enjoy some drinks at the on site bar, order meals at the restaurant and request massage treatments for a surcharge. 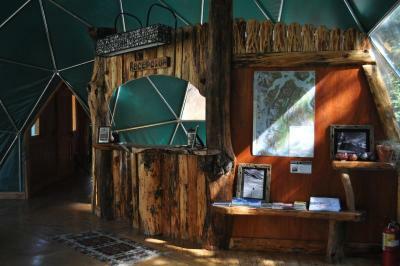 The 24-hour front desk can provide information for getting around the area and arrange ticket services for excursions. 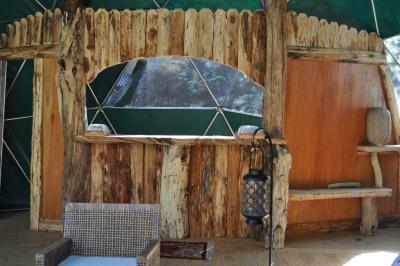 Guests will also find a garden and a sun terrace. Many activities are available in the surroundings, including fishing, horse riding, hiking and cycling. 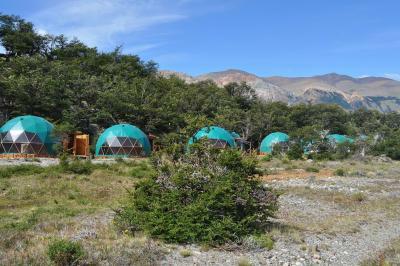 Patagonia Eco Domes offers free parking. 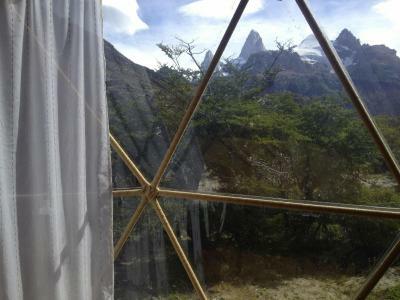 This property also has one of the best-rated locations in El Chalten! Guests are happier about it compared to other properties in the area. 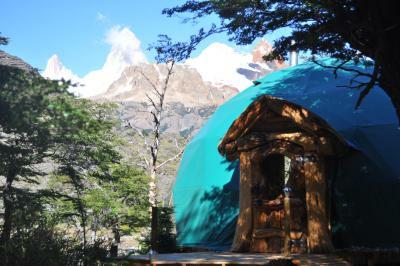 Patagonia Eco Domes has been welcoming Booking.com guests since 3 Feb 2015. 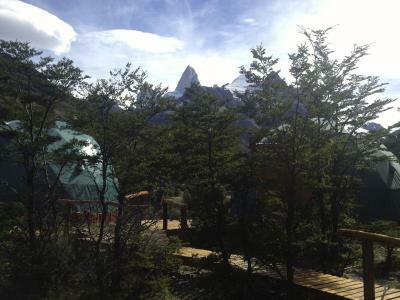 When would you like to stay at Patagonia Eco Domes? A rustic room comprised of a fireplace, a seating area and heating. 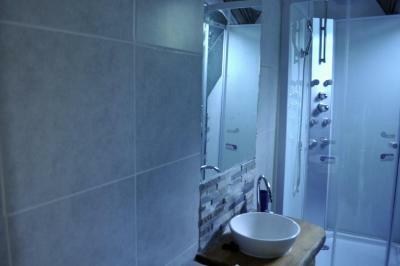 The full bathroom is completed with free toiletries and a shower. Bed linens and towels are provided. This room affords views of the mountains. 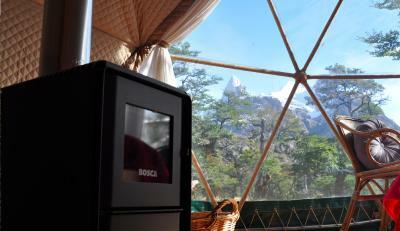 This triple room features partial mountain views. a private entrance, fireplace and seating area. 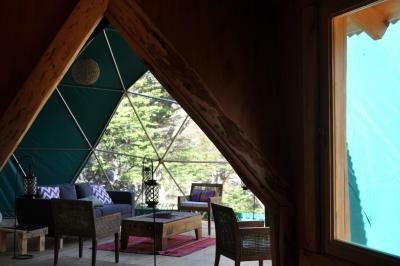 This twin/double room features a view, seating area and fireplace. 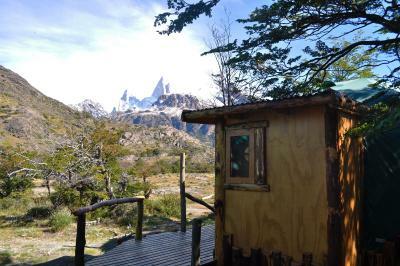 This Eco lodging is placed for you to enjoy the best of patagonia`s views food and peace and making your adventure once in a lifetime experience. 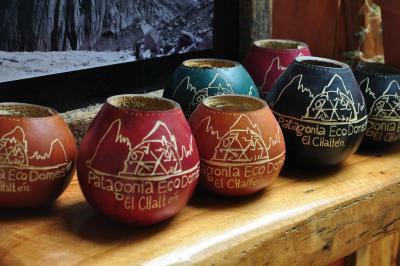 House rules Patagonia Eco Domes takes special requests - add in the next step! Patagonia Eco Domes accepts these cards and reserves the right to temporarily hold an amount prior to arrival. 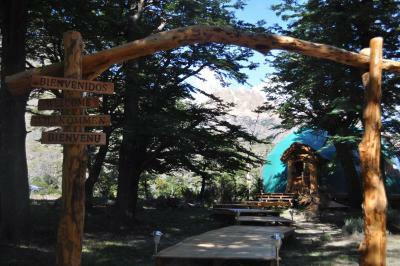 Please note that the property provides free transport to and from El Chalten, exclusive for check-ins and check-outs. The transfer runs on specific times: pick-ups are at 12:00HS., whereas drop-offs take place at 9:00hs. Everything. 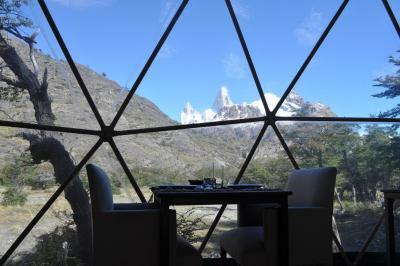 The views were spectacular, the food was fabulous, and the staff was amazing. We were well taken care of. Would not hesitate to recommend. 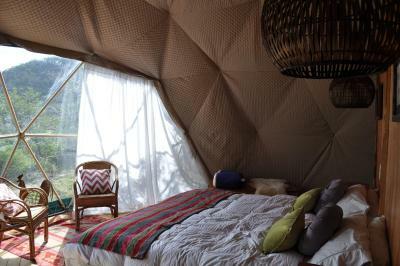 Wood stove is not adequate to heat the tent when it's cold outside but the bed is very comfortable and warm so as long as you stay in bed at night you're fine. Mice were the main issue. They come in when it's cold out and we had a mouse in the bed on a few nights and another one that got into my backpack. Mousetraps should be considered. Staff were great. Very helpful and knowledgeable about the area. Great location about 15 km from town so you feel very isolated. Great views from the tent. 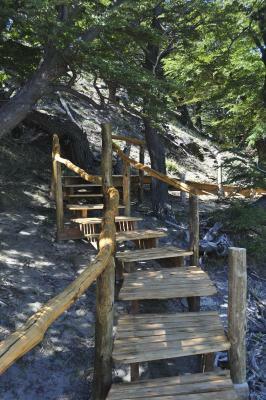 There are a few very nice trails nearby with far less people than those that start from El Chalten. Meals were delicious with several options. Good shower with hot water. We used their shuttle and that worked well. All in all a good experience, we had great weather so it was pleasant. It does get a little cold at night if you don't keep the fire going in your stove. Also, it has a 20 min drive on a dirt road from town. Only complaints though. This experience blew away our expectations. The staff here is on another level. They will start your fire for you at any time to warm your room and will even have it ready by a certain time. They prepared a great sack lunch for us for the trail and cooked an amazingly delicious dinner for us even within 30 min of closing the kitchen. They were happy and eager to help at every turn and could not have been nicer. 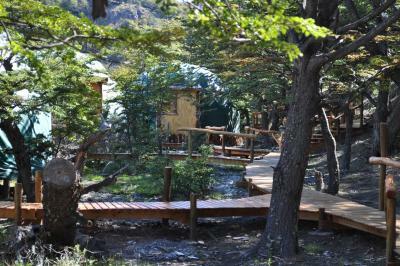 The grounds are gorgeous and provide access to the Fitz Roy hike. Cannot say enough positive things about our experience. 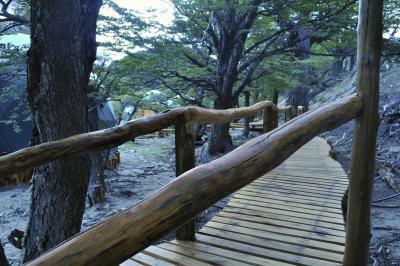 Loved that one of the main trail to Fitz Roy is easily accessible on the location! 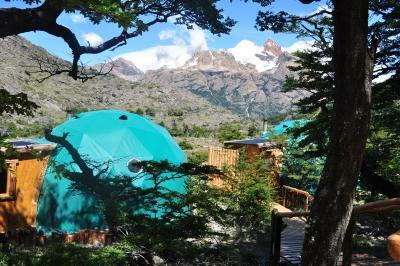 Not necessarily a bad thing, but it is far (25 min drive) from El Chalten. If you're driving yourself, it's on a dirt/unpaved road. If you're planning to do a lot of treks that starts from El Chalten this may impact your plan slightly. 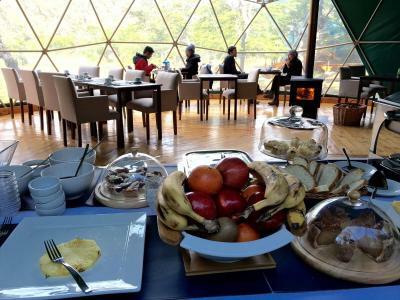 Also, unless you pack your own food, there's no other places to eat besides at the dome, so just be prepared to bring extra money for dinner (they do take credit card too). Everything was great! We only stayed one night but it was perfect. 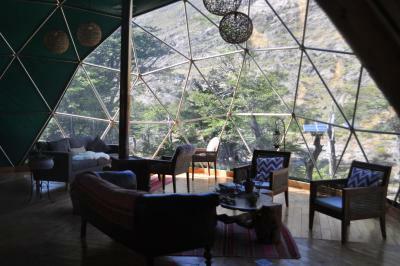 We took the noon shuttle to the domes from El chalten after we arrived, and just relaxed for the rest of the day and walked around the area. The staff is SO friendly and helpful with absolutely everything, and the experience is exactly what we were looking for. 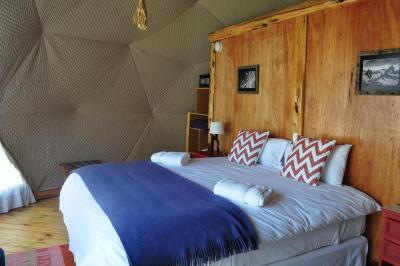 The bed was some of the most comfortable - because the dome is heated by a wood burning fireplace inside, which means it goes out at night if you don't tend to it, they also provide a very warm duvet for the bedding - we didn't find it too cold at night. The breakfast was fantastic!! The only place on our entire trip who had bacon, and they also offer a boxed lunch (for purchase) to take on the hike. Because we only stayed one night and stayed in El Chalten town after, we ended up hiking to Laguna de los tres the next day from the dome (after we checked out) with just our day packs, and did the full loop back to El chalten. 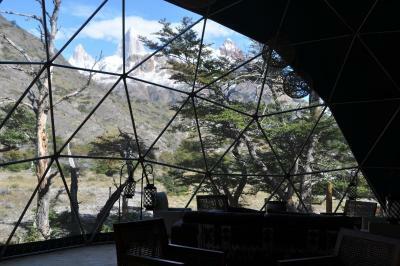 The eco dome actually shuttled the rest of our stuff back to El Chalten (directly to our accommodation in El Chalten) for us so we just go straight there and the rest of our luggage was waiting for us there! This was so convenient!! Cold at night. Long drive down unpaved road from town. Food is great. 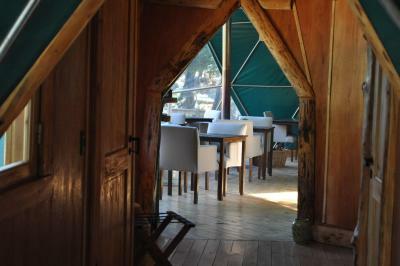 Excellent location right off trail to Laguna de los Tres. Cannot stress how big of a plus location to trail was. 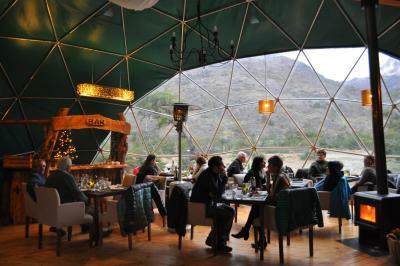 The Patagonia EcoDomes were the highlight of our trip to Argentina. The staff is attentive, knowledgeable, and friendly. The food was consistently delicious. The location and the view could not be more perfect. 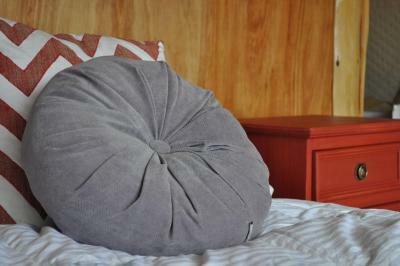 The domes were extremely comfortable. 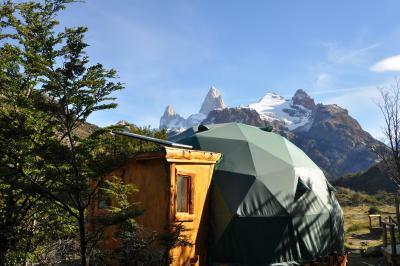 Could not recommend Patagonia EcoDomes more highly. 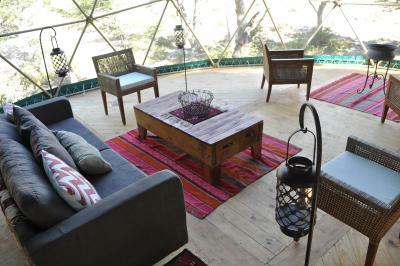 The domes are not perfect and if you would pick negatives, you could improve insulation and bathroom equipment, water pressure, etc.. but you need to keep in mind this establishment is very remote and were happy to overlook those details and just enjoy this unique experience. The price is a little bit high, but when you realise that half board is included, it's not as bad. 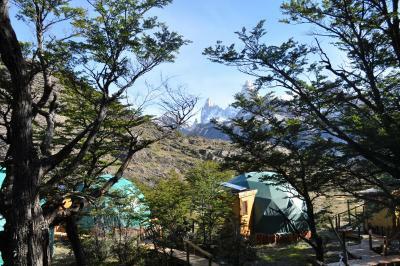 The incredible surroundings - The domes are situated in a very remote location, overlooking the Fitz Roy mountain range from the northern side. 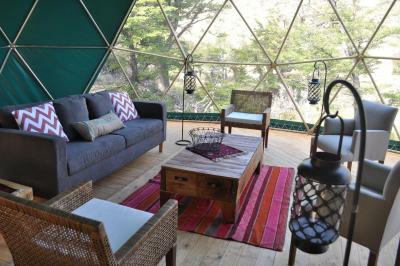 This means you get beautiful views of the sunsets or raging storms from the comfort of your dome, by the fireplace. The Staff - all the staff that we met were amazing. 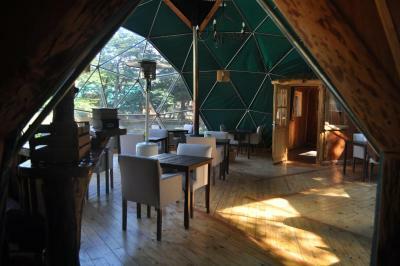 The receptionist was very nice and friendly and told us a lot about the domes and the area, the hikes and activities. The Food - Given the remoteness and conditions, we did not expect much, but the dinner and breakfast were really great, tasty and creative! 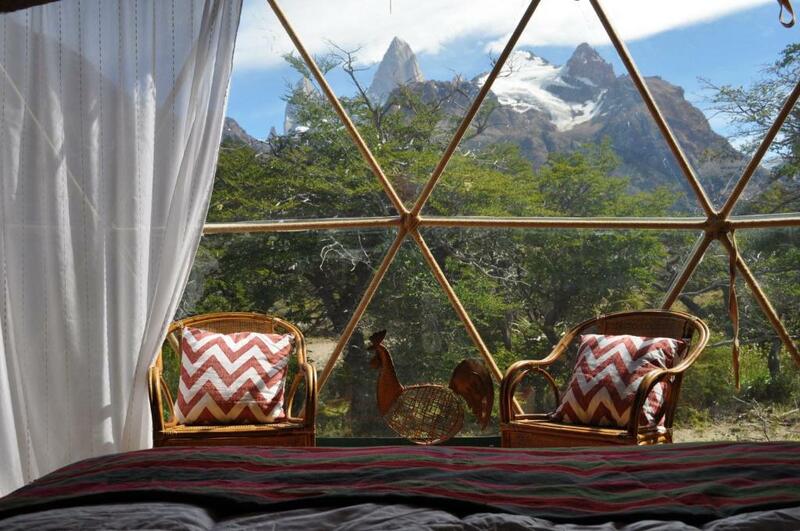 The Privacy - The domes are not perfect (see below), but the amazing feeling of sitting by a fireplace in the middle of nowhere looking at the rabbits running outside during a sunset over Fitz Roy, while sipping malbec in silence, then falling asleep in the sound of strong wind and rain, waking up with a views of the mountains... felt very special. 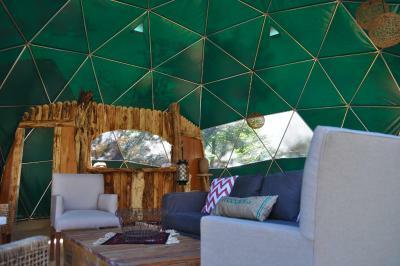 The Design - The domes are something between a tent and a cabin, with clever design and decoration. You feel very cozy and close to nature. We were fascinated by it. The Location - Very close to start of a hike to Laguna de los Tres from the North, which by my opinion is much more enjoyable and scenic than the one from El Chalten. Food was a bit mediocre, particularly on the first night. Although the chocolate cake and wine were excellent. Otherwise no complaints! 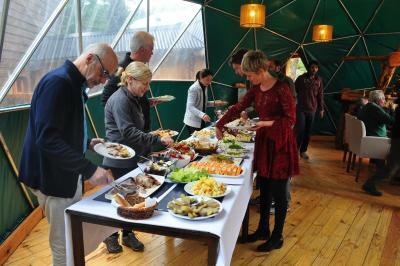 could have a wider variety of food - as we stayed there for 4 days, had some similar food over the few days.